Not just another sound library, Kid Nepro’s “Proto Rock” for the Korg M3 is more like a software program. Regular updates will be released and all Proto Rock owners will be able to update for a small fee. 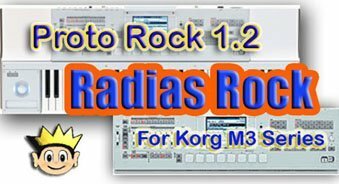 Proto Rock Version 1.2 – “Radias Rock”, the first update is now available and contains sixteen new combis designed for the M3 Radias expansion board. Kid Nepro will also be running specials linking sounds from our sample city vault to all registered users. Build up your M3 and sample sound libraries all at the same time with a great selection of sounds from The Patch King. More info including Proto Rock and Radias Rock demos at our web site.